The MoneyMuseum is a money and currency museum. Its core is the collection of Western leading currencies from over 2500 years. Since it was a free app, I decided to download it and see if it was as interesting as the images on its app page. When the app started, there was no splash screen (GOOD!) 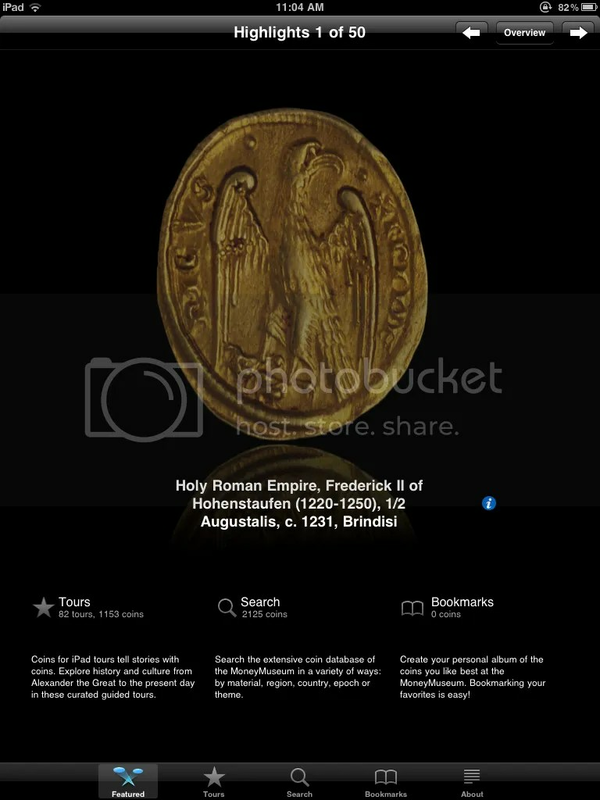 and I was greeted with an image of a gold ½ Augustalis from the rule of Frederick II of Hohnstaufen (1220-1250) of the Holy Roman Empire. 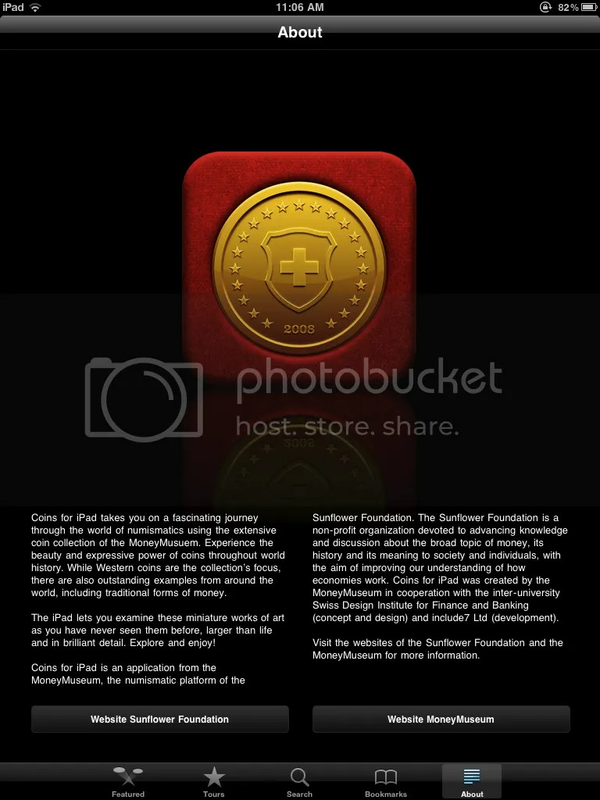 It is the first coin of 50 featured in the their main section. As I looked at the coin, an animation turned the coin over so I could see the reverse. It was so intriguing that I let the slideshow continue. The I figured that if I pressed the arrow in the upper right corner, I could advance the slides faster. Pressing the Tours button at the bottom of the screen, there was a list of several coin types that spread a few screens worth as I scrolled down. There are 82 total tours with a variable number of coins. I came across a tour that said “From Pillar Dollars to Eagle Piasters—the History of the Peso.” Thinking it was mainly about Mexican and South American coins, I was surprised to see a Morgan and Trade Dollar as part of the tour. The descriptions of the tours are brief but informative without distracting from the stars of the app, the coins. The app has coins from all over the world including the United States. 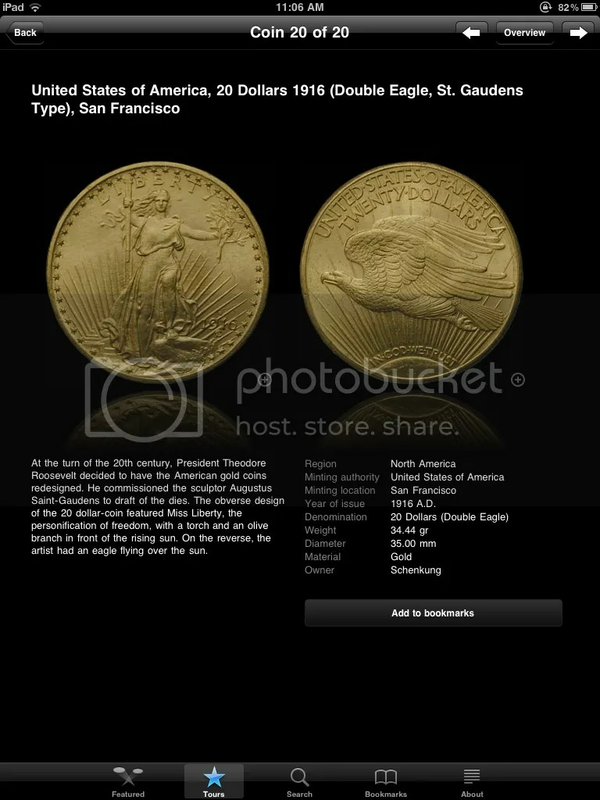 In the section about famous and important gold coins, there is a page dedicated to the Saint Gaudens Double Eagle displaying a 1916 coin. Searching for coins is fast and the display shows off the coin and some basic information. Tap on any coin and see its information page. While playing with the app, I searched for Spanish coins looking for the Pillar Dollar (8 reales) coin. What I found were quite a number of interesting gold and silver coins issued by Spain over the years. In addition to coins, there are some currency issues, most of which is from Switzerland. There is also a section about money that was created using other materials, such as a Ten Strings of Paudina Snails used in Africa during the 19th century. The app is easy to navigate and the images are fantastic. There are a few quirks in loading of the images, but they eventually work themselves out. The tours and information presented are informative, but it would be nice if there were options for a more in-depth description of the coin. Some tours could use more coins or information because there are gaps that makes me feel something is missing. Given how easy CoinsHD is to use and the excellent images, I grade this app MS66. It is a beautiful app and worth the price (FREE). I hope they can fill in some of the holes and provide more information in the future. In the mean time, there are over 2,000 images to keep you busy exploring the international world of money! NOTE: There is a a version of this app for the iPhone. I have not downloaded it but it looks as interesting as the iPad app.